My hats off to those who are truly remote imaging from a distant site! I have spent probably the last 2 weeks troubleshooting the focuser, the guiding and was having trouble with the usb connection from the mount to the laptop timing out. Lots of things can go wrong! I suppose a lot of these remote areas people use from 2,000 miles away have tech support on site available to do this, but I am happy I am just 50 feet away! Anyway last night I ran the system an entire night unattended for the first time in the new permanent location. We took about 5 hours of luminance, some dark frames, bias frames and dawn flats. 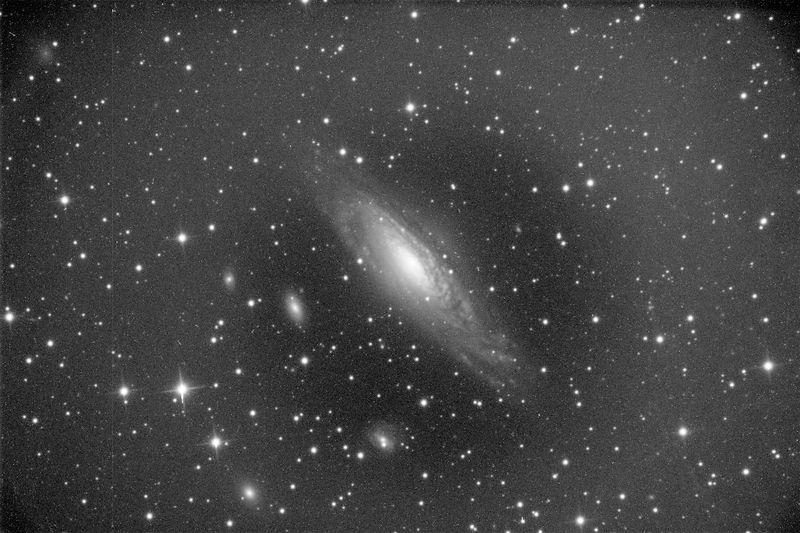 Our target this time is NGC7331. This is a bright spiral galaxy in the constellation Pegasus. Many believe the structure is similar to our own Milky Way. 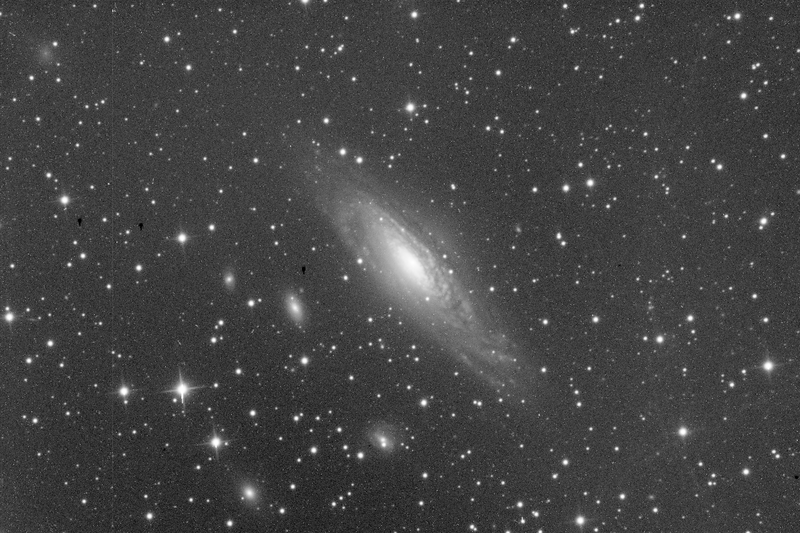 This is a 10 minute raw image of NGC 7331. It was actually a better than average night and we captured a lot of excellent data! 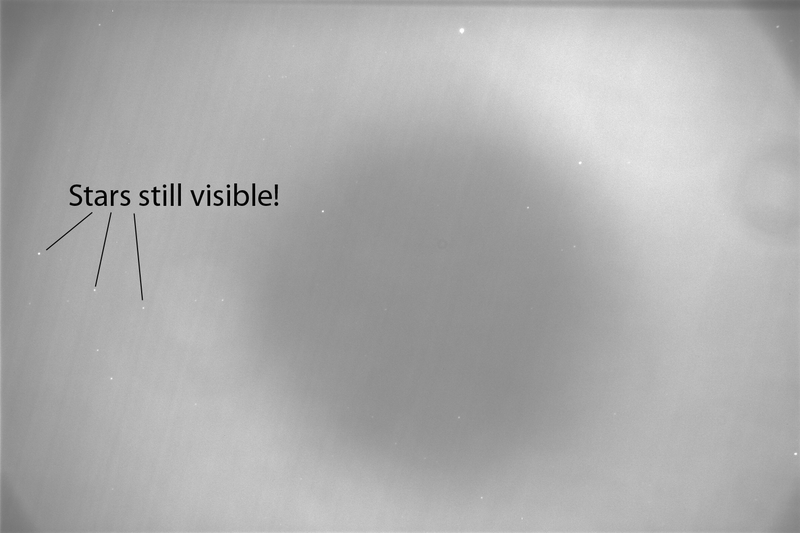 However you can see the donut shaped light patch surrounding the galaxy. This is artificial and the result of excess ambient light and the way the light bounces around inside of the optical tube with the 2 mirrors there. And now you can see how nicely this works! By subtracting the flat field image we have eliminated the donut patch and created a pretty uniform image! Unfortunately we have the 3 black spots from the subtraction of the stars. Typically I will go through the flats and throw out the ones with star images in them so this doesn’t happen!